Recently, in part because of some books that have come my way as an editor, I’ve spent more time than I normally would have becoming acquainted with the experiences of men who have gone to war and returned from it. 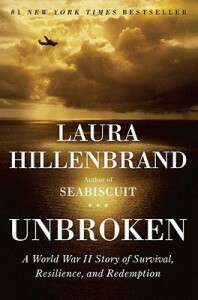 Of these, Laura Hillenbrand’s Unbroken is by far the best, a magnificently well-researched and clearly written account of the life of Louis Zamperini, a young rascal, high school track star, Olympic runner, World War II flyer (a bombardier, not a pilot), prisoner of war, and returnee who was ultimately able to reclaim his life after a few rough years. The true and copiously documented story is by turns heartrending and inspiring. I won’t describe any more of it here. What interests me is good writing. The acknowledgements section at the end, which most people will skip, is revealing. Ms. Hillenbrand had personal access to roomfuls of firsthand source material, above all to the person of Louis Zamperini, who said late in life that if he wanted to know something about what he did in Japan, he’d call Laura. The book was published in 2010, and according to Wikipedia, Louis Zamperini lived until July 2014, dying at age 97, having lived a full postwar life that at first did not start out to be as promising as it turned out. He even managed to remain married to his vivacious wife, whom he met shortly after returning from Japan, for nearly sixty years, a feat in itself. Parts of this book are extremely difficult to get through. Despite the imperfections that drive us to unseemly forms of conduct, humans are by nature loving and compassionate toward one another. Accounts of unspeakable endless brutality of humans against other humans are both exceptionally hard to endure reading and almost impossible to explain. But they do help us to appreciate more the triumphs that happen in the end, when the goodness triumphs over evil. This entry was posted in Arts, Literature, Re: Views. Bookmark the permalink.